Project management is a process that finds and applies the best method to manage and control work through its every stage. There’s never just one way to accomplish this mission, and thus there is never just one methodology for project managers to use. Different methodologies work for different projects, industries, tools and teams. Methodologies can be approached rigidly, as a discipline without any deviations, or more à la carte, where a hybrid of two or more are used to respond to the unique aspects of a project. But you can’t use a methodology you don’t know, which is why good project managers are intellectually curious and never complacent. Project managers who aren’t based in the United Kingdom might not be intimate with the PRINCE2 method of managing a project, which is primarily used by the British government. Although foreign to some, there’s still much to be gained from the PRINCE2 method, even if it isn’t adopted in its entirety. PRINCE2 is an acronym for Projects IN Controlled Environments. It’s a process-based method for managing a project. As noted, it’s been mostly used by the government in the United Kingdom, but it’s also prevalent in the private sector in the United Kingdom and other places around the world. The key features of PRINCE2 focus on business justification, defining the structure of an organization for the project management team and using a product-based approach. There’s an emphasis on dividing the project into manageable and controllable stages, with flexibility. PRINCE2 provides great control over project resources and excels at managing business and project risk more effectively. First established in 1989 by the Central Computer and Telecommunications Agency (CCTA), PRINCE2 was originally based on PROMPT, another acronym that stands for Project Resource Organization Management Planning Technique, which was created in 1975 and used by the United Kingdom for its information system projects. PRINCE2 was finally published in 1996, and surprisingly, it is in the public domain. When will you start it? What do you need to execute it? By organizing the project into logical steps, PRINCE2 demands a framework which has an organized and controlled plan before starting, one that maintains its organization through the middle stages of the project and through its conclusion, tying up any loose ends. The control is achieved by a series of processes. These processes cover all the activities that compose a project, from start to finish. Roles in the PRINCE2 methodology are clearly defined. The project manager is the one who is responsible for the organization and in control of the project and its processes. They select the team who will execute the project and oversee their work to make sure it’s done properly and on time by following a plan. There is also a customer, user or supplier involved in the project. This is the person or organization that is paying for the project. They will use the product of the project or be impacted somehow by its outcome. Sometimes the customer is the user, while the supplier is the party who offers expertise to get the project completed successfully. They, like the project team, need organizing to make sure the project meets requirements. Finally, there’s a project board, which is made up of the customer and executives, such as a person who represents the user side and another representing the suppliers or specialists involved in the project. The project manager will report regularly to the project board, letting them know about progress and any problems. The project board in turn decides on how the project will proceed or resolve issues. 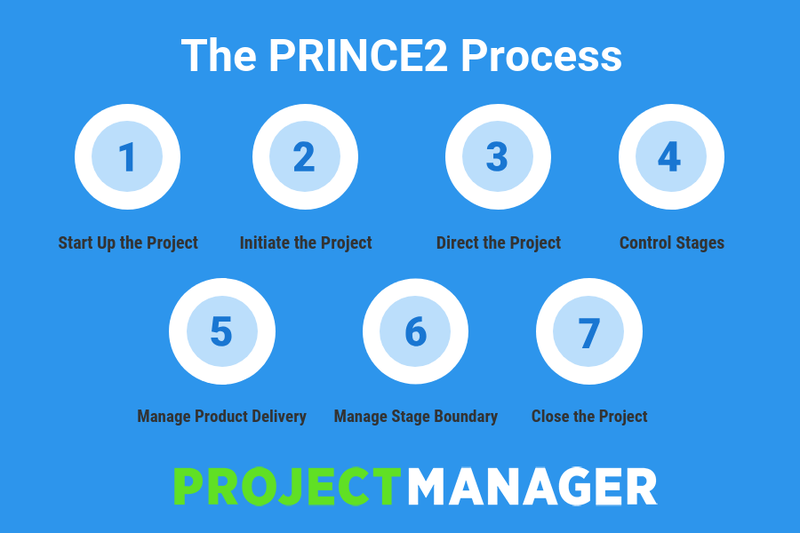 The PRINCE2 process contains the steps that lead to the project objective. There are seven processes that guide the project, each with a set of related activities to help direct, manage and deliver the project. This is where it’s determined whether the project is viable. Once confirmed, it must be approved by the project board. This includes a project brief which contains the business case, the best way to do the project, the name of the person chosen to execute it and a detailed stage plan, which indicates the work that needs to be done by the initiation stage. Activities of this process include the trigger, which is a high-level document stating the project’s mandate. Also, it’s important to do the due diligence before the project is executed to save time and money once the project has started. During this process, several questions need to be addressed: What work must be done in the project? What are the reasons for the project, including risks and benefits and how they’ll be identified and resolved? To answer, define the project scope, including when the products can be delivered without compromising quality. Define how to monitor the project’s progress and who needs to know and how they’ll be informed. The activities associated with this process include constructing risk, configuration, quality and communications management strategies. Also, set up project controls, along with project plan and project initiation documentation. This process is to help the project board be accountable to the project through their decision-making. They have authority on initiating the project, delivering its product and closing the project. They also offer direction and control during the project. Additionally, they work with the corporate entities or program management and review post-project benefits. Activities related to this process include authorizing the initiation, the project itself and the stages of the project. Other direction is offered as needed until project closure is authorized. This is where the project manager assigns tasks, monitors that work, deals with whatever issues arise and reports on its progress to the project board. Activities in this process include authorizing a work package with the team, reviewing its status and progress, and checking on its quality when complete. One must also review and compare progress to the project plan, capture any issues and risks and act to resolve them. This process manages the delivery of the project product, controlling the work between the project manager and the team. Activities associated with this process include accepting the work package, executing the work package and delivering the work package to make sure it’s complete. There are two parts to this process: firstly, the project manager provides the project board with an overview of performance, updates the project plan and business case, and creates a plan for the next stage. Secondly, the information provided by the project manager will help the project board review the current stage, approve the next and review the updated plan. Activities include planning the next stage and reporting on the stage end. This process is about making sure the project achieved its goals and objectives by the deadline. Sometimes project managers prepare the planned closure and the premature closure, but that’s not required. Mandatory activities include handing over the product, evaluating the project and recommending its closure to the project board to officially close it out. PRINCE2 has a course of study that leads to a certification in the methodology. The course requires the user to take the training with an accredited training organization and then pass an exam. It can be done in person or online. Prices for the certification course and exam range from $550 to around $1,000 USD, depending on which level and certified training organization you choose. Project management has more than one certification, and it can be difficult to choose whether PRINCE2 certification or Project Management Professional (PMP) certification is right for you. Basically, these certifications differ in that they offer two different project management frameworks. Both offer a body of knowledge and a proven approach to managing projects. PMP requires a proficiency in the PMBOK Guide to Project Management Book of Knowledge, published by the Project Management Institute (PMI). PRINCE2 certification is broader and generally a higher level, with a well-laid out and standardized approach that spells out the roles and responsibilities of everyone on the project team and divides a master plan into smaller project plans, stage plans and team plans to help execute the project with fewer questions. It’s both project and process focused. Therefore, research both and see which is the best fit for you; consider the work you do and the region in which you do it. Some industries prefer one certification over the other. PRINCE2 is more used in the United Kingdom, Europe and Australia, while PMP is used more in the United States, Canada and the Middle East. Whether you use PRINCE2 or another methodology to manage your project, you’ll need tools to control the work through all of its stages. ProjectManager.com is a cloud-based project management software that has the features to aid any project methodology. From its real-time dashboard to online Gantt charts, you hold the reins. See how it can help you by taking this free 30-day trial today!